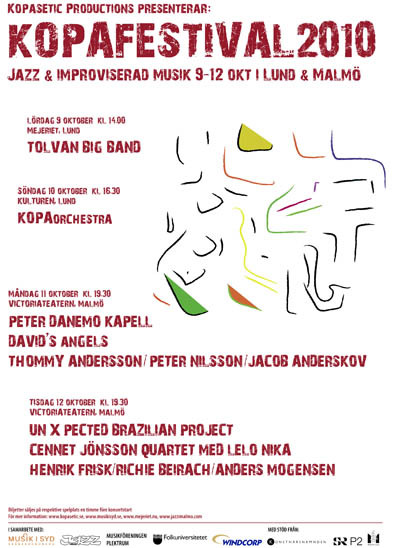 Today the KOPAfestival 2010 started with a concert with Tolvan Big Band in Lund. Tomorrow I will play with KOPorchestra at a concert at Kulturen in Lund and on Tuesday I will play with Richie Beirach and Anders Mogensen at Victoriateatern in Malmö. KOPAfestival celebrates its 5-year aniversary presenting concerts at Mejeriet & Kulturen in Lund and two nights at Victoriateatern in Malmö. The musicians-collective Kopasetic Productions proudly present another unique and top-class festival-programme with a number of exciting constellations, from trios to big band, for all lovers of live jazz and improvised music. The programme offers a great variation of styles and moods, which has always been a significant feature for the KOPAfestival, and introduces performances by great International and Swedish artists such as Richie Beirach (US), Lelo Nika, Emilio Martins (BRA), Marcelo Coelho (BRA), Tolvan Big Band, Peter Danemo Kapell etc. The full programme may be found here.